Brandon Valley celebrates winning the Boys AA State Championship Saturday night. RAPID CITY, S.D. - Both Brandon Valley girls and boys basketball teams are leaving Rapid City champions of high school basketball. 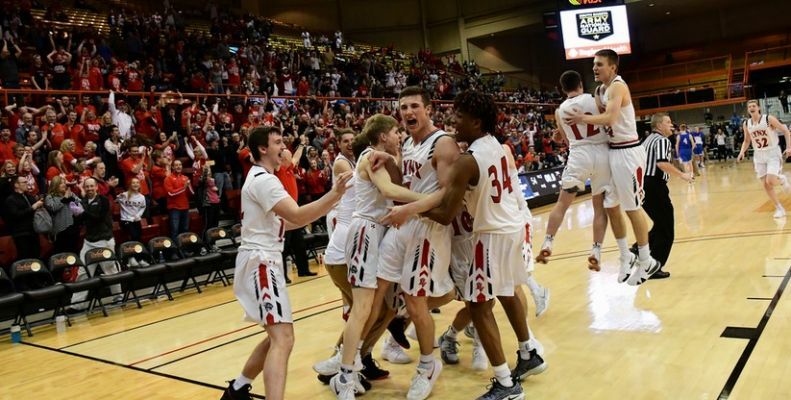 The Brandon Valley boys beat Sioux Falls O'Gorman 54-47 and the girls defeated Sioux Falls Lincoln 60-40 to win the state championships Saturday night. The Lynx boys pulled away from the Knights in the fourth quarter as the two teams traded the lead back and forth until then. Brandon Valley would outscore O'Gorman 23-14 in the fourth. Harrisburg needed overtime to escape with a win over Yankton 70-64 in the third place game and Sioux Falls Roosevelt beat Sioux Falls Lincoln 67-49 for fifth place. Huron beat Rapid City Stevens 61-56 for seventh place. In the girls championship, the Lynx cruised over Lincoln, outscoring the Patriots 18-8 in the second and 15-9 in the third. Trinity Law led the Lynx with 17 points. In the third place game, Harrisburg beat Mitchell 49-44. In the consolation games, Rapid City Stevens edged Sioux Falls O'Gorman 41-44 for fifth place. Kyah Watson led the Raiders with 11 points. Sioux Falls Washington just got by Brookings 45-43 for seventh place. On a side note, the Rapid City Stevens cheerleaders captured the Spirit of Six Award for the girls tournament. The Yankton Cheer Squad won the award for the boys tournament.